Rejoice Emiya I mean Transformers fans! The TRANSFORMERS Cybertron Con will be coming to Singapore this year, a first for Southeast Asia. 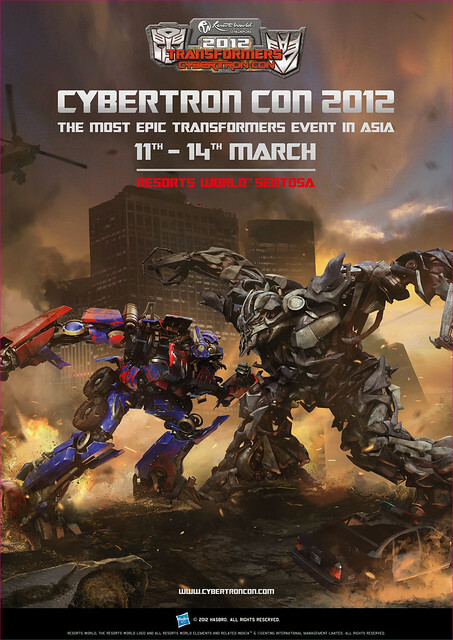 This is the 2nd edition of the Cybertron Con with the inaugural convention held previously in Shanghai in 2010. The 4 days event will be held at the Resorts World Convention Centre from 11 to 14 March 2012. At the event, visitors will get to see an extensive collection of historical TRANSFORMERS items from throughout the brand‟s 27 year history. Convention-goers can also expect limited edition 2012 TRANSFORMERS Cybertron Con souvenirs while supplies last. Hasbro will also display the latest line of TRANSFORMERS toys and products which will be available for purchase during the convention. And also not forgetting the exclusive Cybertron Con items. These items will only be revealed at the event itself. But perhaps the most exciting and one that I am most anticipated about is knowing that Mr. Hideaki Yoki, the lead designer of TRANSFORMERS in Takara Tomy, will be coming as well. Who is Hideaki Yoki, what does he do and why is he so awesome? Check out the video below. – National „Fastest Fingers First‟ Challenge, testing convention goers‟ skills at converting TRANSFORMERS action figures from “robot” to “vehicle” modes. Tickets for the convention are priced at $12 for a Day Pass and $68 for a four-day VIP Pass. Overseas visitors might be interested in the special 3D2N TRANSFORMERS Cybertron Con The Epic Battle Package – comprising hotel accommodation, a pair of one-day passes to Universal Studios Singapore, admission to the TRANSFORMERS Cybertron Con 2012, and the Maritime Experiential Museum & Aquarium (MEMA). Guests making reservations before 1 March 2012 will enjoy S$100 off the regular price of S$988. There is also The Battle Pass, consisting tickets to Universal Studios Singapore and Cybertron Con, are also available at $77 (Adult), $62 (Child) and $48 (Senior Citizen). Tickets can be reserved now at Resorts World Sentosa website, ticketing booths located at Universal Studios Singapore, RWS Ticketing and Membership Hub and MEMA or via hotline +65 6577 8888. Stay tuned to Cybertron con 2012 website and Facebook page for more info.